Deal, P.H. "Jake" Saginaw, Michigan Passed away Monday, January 23, 2017 at Hoyt Nursing & Rehab Centre. Age 95 years. Jake was born on March 17, 1921 in Plainwell, Michigan to Perley and Minnie Deal. 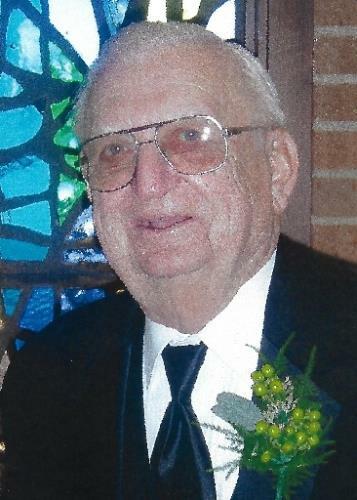 Mr. Deal was a professional salesman, representing many companies including Singer Sewing Machine Company as Manager, Michigan Bell, Top Value Stamps, owner of Deal's Service Center, Walz Industrial Supply, Valley Surgical Supply and Job Developer for Experience Works. He graduated high school in Ellwood, Indiana and attended Alma College in Alma, Michigan. He served his country in WW II in the Army. On November 8, 1942 he married Margaret Leachman who passed away on May 17, 1990 after 47 years of marriage. Margaret and he had four children, Howard Deal (Cindy Marcoux) of Saginaw; Patrick Deal (Michelle Kubitz) of Redford, Michigan; Mary Margaret (Ben Fletcher) of Saginaw; Cheryl (Greg Becker) of Saginaw; also surviving is a very special niece, Jean Ann Bishop, Saginaw; six grandchildren; nine great grandchildren; and one great-great grandchild; many nieces and nephews. In June 1992, he married June Richter who died March 30, 1994. Preceding him in death were sisters, Pauline Sonntag (Clarence), Colleen Van Connett (Jack), and brothers Brayton Deal (Miriam), and Raymond Deal (Patricia), sisters-in-law Regina Sonntag (Robert), and Agnes Turrell (Ford). Jake enjoyed entertaining and seeing people laugh and smile with his stand-up comedy act and daily jokes. He wishes to be remembered for his humor. He had performed at Pit and Balcony. Jake was a member of the Moose Lodge #82, Knights of Columbus, Riverside Kiwanis, Masonic Lodge #154, The Shriners, American Legion Post #439, and a member of the St. Helen Golf League for 47 years. Funeral Liturgy will take place 10:00 a.m. Saturday, January 28, 2017 at Holy Spirit Catholic Church, 1035 N. River Road in Saginaw. Rev. Fr. Robert H. Byrne will officiate. Interment will follow in St. Andrew Cemetery where military honors will be presented by V.F.W. Post #1859. Friends may call at The Snow Funeral Home, 3775 N. Center Rd., (between Shattuck and McCarty), where the family will be present on Friday from 2:00 p.m. to 8:00 p.m. and at Holy Spirit Catholic Church on Saturday from 9:00 a.m. until time of Mass. Family and friends will pray the Rosary 4:00 p.m. Friday at the funeral home. In lieu of flowers, memorials may be directed to the Pit and Balcony of Saginaw.